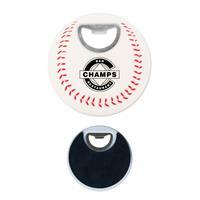 This magnetic bottle opener is a great promo item that will find a home on your client's fridge and be used everytime they go to crack open a cold one. Dual-style magnetic bottle opener that works with both twist-off and pop-top caps. White base with your choice of colors for the top portion. The perfect promo item for any Football fan! 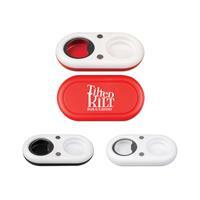 Perfect for bars and restaurants to give away during viewing parties at Professional and College Football games! 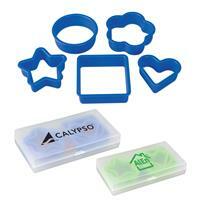 Get ready to bake with this 5 piece cookie cutter set. A unique and adorable giveaway/gift idea for schools, baking clubs, or bakeries. Comes in two colors: Green (S21253X) and Blue (S21252X). One location imprint only. 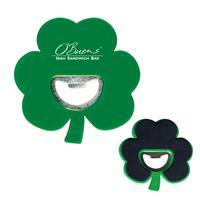 This festive coaster with built in bottle opener is great for your next party! Perfect for any type of St. Patty's Day event. Also great for restaurants and bars! 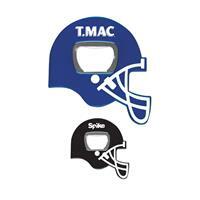 Add your custom imprint and pass them on to your clients. One location imprint only. 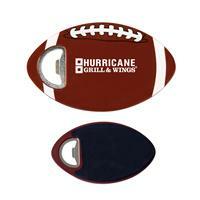 This football shaped coaster with built in bottle opener is great for your next sporty promotion! Perfect for any type of sports gathering. Also great for restaurants and bars! Add your custom imprint and pass them on to your clients. One location imprint only. 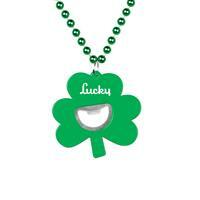 Our Shamrock Bottle Opener Medallion Beads are the perfect product for all things St. Patty's Day! Parties, parades, events, restaurants, bars, and more! We apologize but due to state regulations we are unable to ship bead products to California. Make your own kitchen utensil kit! 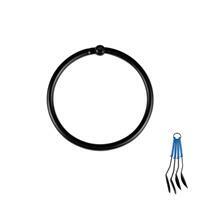 This ring can be used to combine any of our new kitchen utensils (KTC4, KTC5, KTC6, KTC7 and S63000X). NO IMPRINT. Who says there's no drinking on the job? 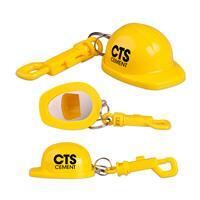 This construction hard hat bottle opener is sure to get a few laughs. Features a belt hook so it's always close by. 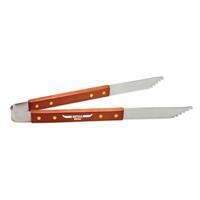 Barbecue Tongs that are made out of metal and wood. Item Size: 14". This Barbecue Spatula features a Wood handle to reduce heat, stainless steel construction for lasting performance and incorporates a bottle opener into the spatula head. Item Size: 15". Black Barbecue Cleaner made of plastic and metal. Item Size: 17 1/2".